Is this the dawn of a new Eurozone crisis? The shares of Deutsche Bank, Germany's largest bank, have lost 40pc of their value since the beginning of the year. Italian banks have taken an even worse battering, with their shares having lost 40pc of their value. When the Eurozone crisis first erupted in 2009, most economists focused their attention on the problems of the PIIGS (Portugal, Italy, Ireland, Greece and Spain) on the periphery of the single-currency area. Ireland, Portugal, Cyprus and Greece were forced to agree to bailouts from the EU/ECB/IMF Troika while Spain and Italy were placed under the economic equivalent of adult supervision with their budgets being closely scrutinised in Brussels and Frankfurt. The repeated Eurozone crises since 2009 have also led to major improvements in the architecture of the Eurozone, with the ECB taking over the supervision of its larger banks in 2014. Mario Draghi, president of the ECB since November 2011, has cut interest rates to record low levels - the ECB now charges banks for the privilege of depositing money with it. The ECB has also launched a massive programme of quantitative easing on Mr Draghi's watch and is now buying €60bn a month of Eurozone government bonds. The reforms to the Eurozone structures along with Mr Draghi's aggressive interest rate cuts and QE have yielded some results. Ireland and Portugal have exited their bailouts and Cyprus is set to do so next month. The Spanish economy is growing again. This good news doesn't seem to have satisfied the markets. The Eurstoxx Index of European bank shares is down 27pc so far this year and by a massive 42pc from its April 2015 peak. Worst-hit have been the shares of the Italian banks, which are carrying €330bn in non-performing loans on their balance sheets. The Italian government has introduced legislation that will see the country's 4,000 community banks merged into a single lender. It has also persuaded the EU Commission to allow it to buy up to €70bn of bad loans from the country's banks. The markets aren't convinced that this will be enough to stop the rot. One bank, Italy's third-biggest lender Monte Dei Paschi di Siena, is causing the greatest worry, with its share price down by 56pc so far this year. 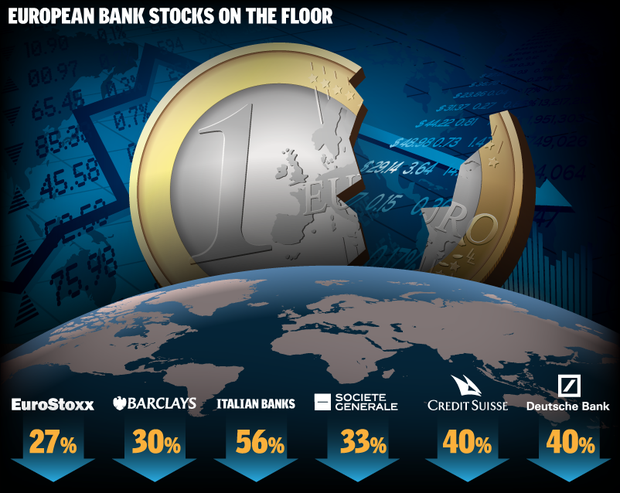 It isn't only Italy's banks that have seen their share prices clobbered in recent weeks. The price of SocGen, the third-biggest French bank, have fallen by a third since the start of the year while, outside of the Eurozone, the share price of British bank Barclays has fallen by 30pc and Switzerland's Credit Suisse by 40pc over the same period. However, it is the plight of Deutsche Bank - Germany's biggest - that is causing most consternation among investors. Last week, co-chief executive John Cryan was forced to issue a humiliating statement urging the bank's employees to reassure clients that Deutsche "remains absolutely rock solid". For good measure, German Finance Minister Wolfgang Schaeuble declared that he had "no concerns about Deutsche Bank" in an interview with Bloomberg Television. We have no doubt that Messrs Cryan and Schaeuble were being sincere, but with the Deutsche share price having fallen by 40pc since the beginning of the year the markets are going to need a lot more reassurance. To realise just how extraordinary Deutsche's current predicament is, a brief history lesson is called for. Founded in 1870, a year before Bismarck united Germany for the first time, Deutsche played a key role in financing the country's industrialisation. It acted as midwife to the creation of Daimler in 1926 and has worked with successive German governments, both democratic and dictatorships, through war and peace over the past 146 years. When former Deutsche boss Josef Ackermann threw a party to celebrate his 60th birthday in 2008, Chancellor Angela Merkel wasn't able to make the bash due to a scheduling clash. Instead, she invited Mr Ackermann - and 30 of his closest buddies - to dinner at the Chancellery in Berlin a few weeks later. That's the sort of top-level political access that most bank bosses can only dream of. This, of course, begs the question: why has the market turned so bearish on Deutsche? Isn't the German economy, its exports rendered ultra-competitive by a cheap euro, growing strongly? After all, it had GDP growth of 1.7pc in 2015 and the EU Commission predicted 1.8pc growth this year. Some of its problems are unique to Deutsche. It announced last Wednesday that it expected to report losses of €6.7bn for 2015. One of the biggest contributors to the record loss was a $2.5bn fine imposed on Deutsche by the US and British authorities for its role in the LIBOR interest rate-rigging scandal. The fallout from that looks set to continue, with banking analysts predicting €3.6bn of largely LIBOR-related litigation costs this year and more to come out to 2019. This means that Deutsche will almost certainly have to raise fresh capital from its shareholders, if not this year then certainly in 2017 or 2018. However, Deutsche's travails also point to a wider malaise in the European banking sector. While Mario Draghi has been widely praised for his leadership of the ECB over the past four-and-a-quarter years, there are now clear signs that the policies being pursued by the ECB are having unforeseen consequences. When Mr Draghi dramatically said in July 2012 that "within our mandate, the ECB is ready to do whatever it takes to preserve the euro, and believe me, it will be enough", he almost certainly saved the single currency from self-destructing. Although the promised bond-buying by the ECB took much longer to materialise than many had hoped, as Mr Draghi overcame the opposition of the representatives of Germany and the other creditor Eurozone members on the ECB Council, the realisation that 'Super Mario' was preparing a massive response deterred speculative attacks on the euro even before quantitative easing was up and running. But maybe you can get too much of a good thing. In addition to the ECB's cuts in its official interest rates, its bond buying programme has driven up the price of Eurozone government bonds and pushed down their yields or interest rates. Five-year German and French government bonds now trade on negative yields - in other words, investors are effectively paying these governments to borrow their money from them. While negative interest rates may be an appropriate short-term response to a financial crisis, they play havoc with bank profitability if sustained for the medium or long term. Bankers traditionally operated on the "three-six-three" model - take in deposits at 3pc, lend the money out at 6pc and be on the golf course for three o'clock. This model breaks down in a negative interest rate environment. When companies and individuals are reluctant to borrow, as is currently the case, banks traditionally deposited their surplus cash with the central bank or bought government bonds instead. Negative interest rates mean that this option is no longer open to them, as to do so would mean they made losses every time they either deposited money with the ECB or bought Eurozone government bonds. Further complicating matters is the fact that the ECB's bond purchases are seriously distorting the market for Eurozone government debt. If the ECB's bond-buying continues at its current rate, the ECB and the Eurozone national central banks will own 25pc of the entire Eurozone government bond market by the first half of 2017. "There is a contradiction between the ECB's price stability mandate and its prudential stability mandate. While seeking to do both it could prevent financial stability from being achieved. One could see a perfect collision between the two parts of its mandate," says David Marsh, author of the history of the euro, The Battle for the new Global Currency. The 2008 global financial crisis exposed how inadequately capitalised most banks, including the Eurozone ones, really were. The response of the ECB was to raise the level of capital required by Eurozone banks. Once again the law of unintended consequences kicked in. Instead of selling new shares - something that would have diluted the holdings of existing shareholders - many banks, including Deutsche, issued contingent convertible bonds (CoCos). For investors, the beauty of CoCos was that they paid a much higher yield (typically 5pc to 5.5pc) than traditional bonds. The attraction for the banks was that they didn't have to dilute their existing shareholders. But there was a catch. It turns out that CoCos were much riskier than investors anticipated, with the issuing banks having the right to skip interest payments and convert them into ordinary shares instead. Just before Christmas, a previously obscure Portuguese bank, Novo Banco, did just that. Investors were spooked and wondered which bank might be next to impose a haircut on holders of CoCos. Deutsche Bank has issued €1.75bn of CoCos. They have lost 19pc of their value this year and are now trading at less than 75c in the euro. So are we in the early stages of the next Eurozone crisis? "Markets are waking up to the fact that the Eurozone banks are weaker than they say they are," says Phillipe Legrain, who served as an economic advisor to former EU Commission president Jose Manuel Barroso. "The next phase of the Eurozone crisis is not there yet. It is serious in a chronic sense in that the failure of the banks to clean up their balance sheets is acting as a brake on economic recovery. "Whether it's serious in an acute sense, I'm not so sure." Mr Legrain believes that Deutsche is under-capitalised and some sort of a capital-raising exercise is inevitable, sooner rather than later. However, Marsh points out that it is much less systemically important than it was in the 1970s and 1980s. His fear is that the ECB, having raised market expectations of dramatic action, will fail to deliver at its next meeting on March 10. So the good news is that the recent collapse in bank shares probably doesn't herald yet another full-on Eurozone crisis. The bad news is that, with Greece almost certain to fail to meet the terms of its latest deal with the Troika, another Eurozone crisis is probably inevitable within the next 12 to 18 months - regardless of what happens to bank share prices.